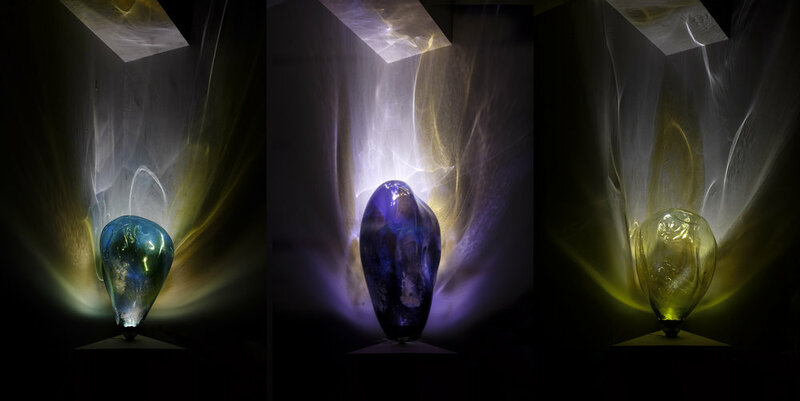 A series of hand blown glass lamps are used to generate particular resonances through tonalities of light - the coloured glass is derived from analysis of the cosmic radiation spectrum, (whereby celestial bodies with varying compositions emit differing spectrums) based on concomitant psycho-physical affectivity. Bubbles are models of the expansion; cosmic breath embodied in crystalline fabric. Light animates, emanating through its contours and ripples. An individuating event; the evocation of presence.